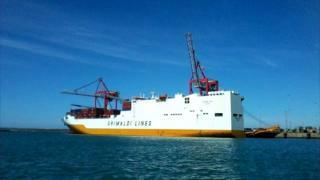 Four alleged stowaways have denied attempting to hijack a cargo ship in the Thames Estuary. Members of the Special Boat Service (SBS) boarded and secured The Grande Tema at 23:00 GMT on 21 December and four men were detained. Samuel Jolumi, 26, Ishola Sunday, 27, Taheeb Popoola, 26, and Joberto McGee, 20, appeared at Basildon Crown Court and pleaded not guilty to the charges. They also deny charges of making threats to kill and affray. A provisional trial date has been set for 2 October and the case is listed for six weeks. All four are said to have boarded the 71,000-tonne vessel in Lagos, Nigeria, on 10 December that was heading for Tilbury in Essex.